This is our custom-built Specialty "Stereo Y" cable with TRS 1/8 (3.5mm) Gold Right Angle" Male to connectors of your selection. Construction is Mogami 2697 cable, Neutrik/Rean Gold 1/8" Right Angle connector to a selection of connectors. The Stereo TRS 1/8" Male "Y"s to your selection of connectors (one Left shrink labeled white, one Right shrink labeled red). Neutrik connectors are some of the best connectors around. 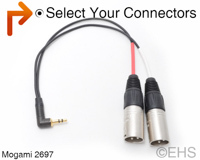 Mogami 2697 cable is a miniature mic cable style cable and is a thin, very flexible, durable, light-weight cable. Photo 1 shows the wire thickness.